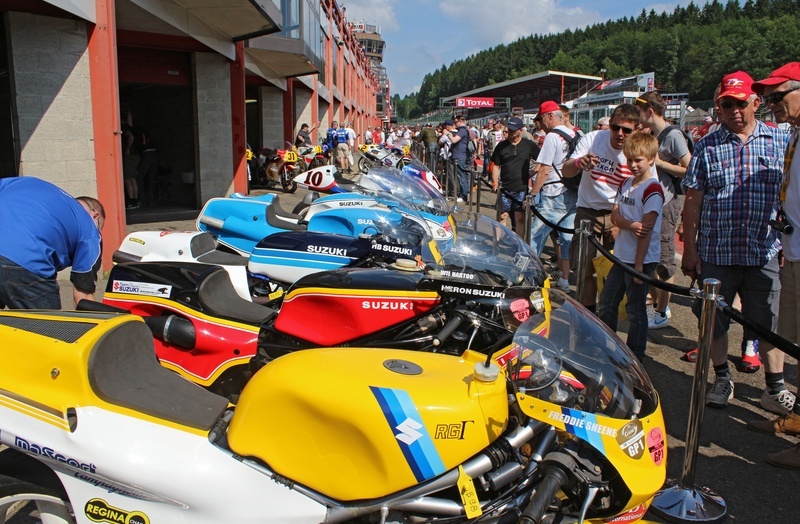 Regular visitors of the Bikers’ Classics have known for a long time that it’s party time in the first weekend of July at the Spa-Francorchamps circuit. This year marks the 40th anniversary of the Suzuki RG500 and that surely is an extra reason to party hard. This 12th edition of the Bikers’ Classics marks by no means a dirty dozen. There is an unprecedented line-up in the Sidecar Parade, there’s the 4 Hours of Spa Classic and lots more. Any questions? YES, A FEW. HOW MANY RGs WILL BE SMOKING UP THE RADAILLON? Honestly, at the moment that is still unclear. Thanks to the hard work that the ‘connaisseurs’ of the Amicale Spirit of Speed are putting in, names and bikes are still being added to the list. You can be sure that it will be dozens of RGs. Brit Steve Wheatman is one proud owner of the world’s biggest private collection of Suzuki racing bikes and thankfully he will be joining this year’s party again. He will be bringing along some of his two-wheeled treasures for men like Mick Grant, Steve Parrish, Tepi Länsivuori and Wil Hartog. And more. ‘Suzuki’ Steve is bringing fifteen bikes. Yes, fifteen! A few, well… Okay. There’s the Suzuki XR14 that Barry Sheene won the 1975 Dutch TT on. That was the first Grand Prix win for an RG rider. Pretty historic! Then there’s the XR27 that Sheene rode during his unforgettable battle with Kenny Roberts in the 1979 Silverstone Grand Prix…. The XR34 that Randy Mamola won the 1980 Belgian Grand Prix at Zolder on… A rare Daryl Beattie XR86… Nobu Aoki’s XR88… And what about Kevin Schwantz’s 1994 Lucky Strike XR84. His former teammate Didier de Radiguès will be riding the bike. But there’s more exotic stuff. Jack Middelburg was the last privateer to win a Grand Prix and his 1981 bike is on display. As is a very exclusive HB Suzuki TGA1-500 that Roberto Gallina and Massimo Tamburini built. The bike was not successful but with Tamburini at the helm, it is a true beauty. You can see and hear it at Spa-Francorchamps. SURELY, THERE’S MORE TO SEE THAN JUST SUZUKIS? Of course. The French Team Classic Racing Motorcycles will bring a few wonderful Yamaha YZR500s from 1986 and 1989, to be ridden by none other than Steve Baker and Christian Sarron. Hubert Rigal will mount his immaculately restored Yamaha 0W31. And fans of a unique sound sensation should try and get very close to those very special Königs. You can’t visit the Bikers’ Classics and not go into the pitlane. BUT HOW CAN I GET INTO THAT PITLANE? That’s simple. No hassle with passes and scans. At the Bikers’ Classics, the pitlane is a ‘go area’, so to speak. With your entry ticket you get access to the paddock and the pitlane. This is your chance to get face to face with one of your old heroes and with legendary machines. YOU MENTIONED AN UNPRECEDENTED LINE-UP IN THE SIDECAR PARADE? Steve Webster. Alain Michel. Egbert Streuer. Rolf Steinhausen. Werner Schwärzel. Steve Abbott. Bruno Holzer. And…. Rolf Biland and Kurt Waltisperg! There’s nine reasons for you to come to Spa-Francorchamps… All those former World Champions will be there! And they are going to ride! The stuff they’re bringing will make you weak in the knees. Biland will be there with an LCR Swissauto, Michel with a Krauser-Yamaha, Webster with a Windle-Yamaha, Steinhausen with a Busch-König… And then there’s a whole flood of LCR-Yamahas… As usual, the sidecar greats have an open-door policy. Over thirty sidecar outfits will be on display in a huge tent in the paddock. And if you happen to see two guys sweating and working hard, it could be Derek Jones and Brian Ayres. WILL THERE BE ANOTHER ‘4 HOURS OF SPA CLASSIC’ ON SATURDAY EVENING? Absolutely! That race has been part of the Bikers’ Classics for quite some years now. And every year the teams – with the occasional former Grand Prix and World Superbike rider – and bikes seem te be getting better and stronger. The European Classic Series have become a fun but extremely serious game by now and the Spa-Francorchamps race is the second in the four race championship. ARE THERE ANY MORE RACES? You bet. 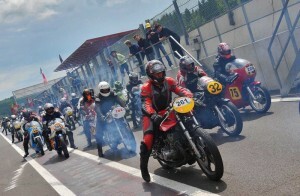 There’s races for the Belgian Classic Bike Championship for 350 and 500cc bikes from 1950 to 1972. Those races also count for the international IHRO Championship. Apart from that, there’s the International Classic Grand Prix with two races on Sunday. Those guys really go at it on those old 250 and 350 Kawasakis, Yamahas and Rotaxes. Also a solid item on the programme by now: the CSBK Masters Series, a series with old – mainly – ‘naked bikes’. Let’s say a bit retro AMA Superbike style. Cool bikes! ARE WE GOING TO SEE THE PARADE ON THE OLD CIRCUIT AGAIN? Never change a winning formula. So: yes, on Saturday evening some 750 classic racers will ride the old 14 km/8.7 mile track. It sounds so simple. And it is. But it’s so special. Again: yes. Do you ride a Suzuki? You’re in luck. Suzuki owners can wander through the paddock the whole weekend for 25 euros (instead of 40 euros), while their bikes are parked in a designated parking area. 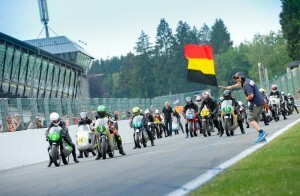 On Saturday evening they can join the Bikers’ Classics participants in the special parade on the old circuit. And of course there’s plenty to see for non-Suzuki riders too. Of course there’s the auto-jumble and the traditional rock concert on Saturday evening. As usual the www.bikersclassics.be website tells you all you need to know. It reveals the whole programme, the list of participants and ticket information. I’m going to tell you anyway: on Friday a ticket will cost you 15 euros, on Saturday it’s 25 euros and Sunday tickets are 20 euros. There’s also a weekend pass with access to the paddock and the grandstand for only 40 euros. By the way, did you know which circuit hosted the fastest ever Grand Prix and also holds the records for fastest ever pole and race lap? That’s right. Spa-Francorchamps, back in 1977. And all those records were set on a Suzuki RG500. Who clinched pole? Philippe Coulon. He will be back on a Suzuki at the Bikers’ Classics. That can’t be a coincidence! National Motorcycle Museum Pop Up Gallery is Live! Bikers Classics – Lucky Thirteen!